Double-Welt Trim covered with Customer’s Fabric - A yard of fabric is needed to make double-welt trim. (one yard is enough to make trim for several shades). Designed to the customer’s specifications. Shown here with customer’s fabric covered double welt trim. Bottom hem with looped tabs to hold a rod (rod is supplied by the customer). 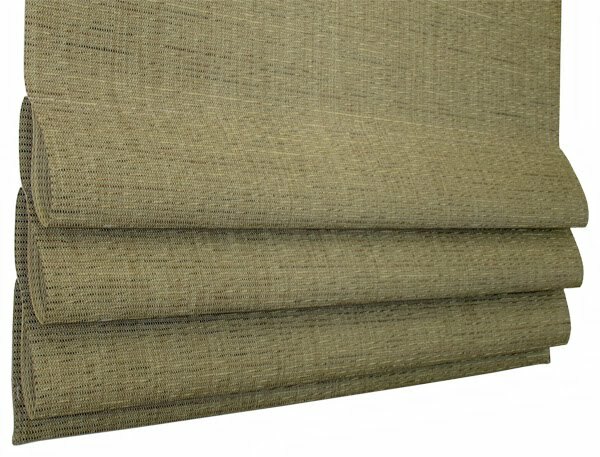 Shade Toppers are designed for use with Romanzia Roller Shades and are available in the same variety of hem styles pictured for shade hems. They feature our unique fused lining process for a neatly tailored appearance. Shade Toppers attach to a mounting board (included) with hook and loop fasteners. See Topper Price List. Shade toppers should be ordered with a face width at least 1/2" wider than the bracket to bracket width of the shade they cover. A spring roller at the bottom keeps the shade in constant tension while the hem is lifted with a cord through a locking pulley at the top of the window. Can be made with Customers Own Material or In-House Fabrics. A spring roller at the bottom keeps the shade in constant tension while the hem is lifted with a cord through a locking pulley at the top of the window. A template is needed. Stationary Panels. Flat Panels of shade fabric are fastened to a wood headrail. Bottom hem is turned with a hidden hem bar and hangs free. Deduct 10% from the standard shade price. Hook and Loop attachment is optional - add $5 per foot of width for hook and loop attachment. Angled Top Stationary Panels. 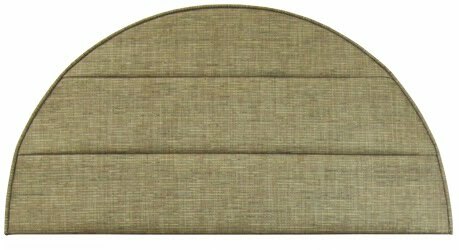 Flat panels of shade fabric are fastened to a wood headrail. Top is angled to fit your precise measurements or match your template. Bottom hem is turned with a hidden hem bar and hangs free. Price as if the panel were a standard rectangular roller shade and add $60. Hook and Loop attachment is optional - add $5 per foot of width for hook and loop attachment. Arched Top Stationary Panels. Flat or pleated panels of shade fabric are fastened to a wood frame to match your template. Please call for pricing. 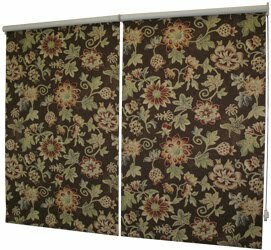 Clutch roller shades can be coupled together so that two or three shades can be operated with one clutch. The gap between coupled shades is about 3/4”. For in-house fabric and plain customer’s fabric shades, add $50 per coupler. 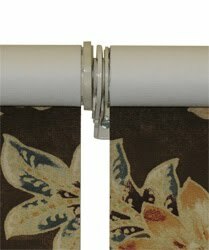 For customer’s fabric shades with patterns that need to be coordinated, add $75 per coupler. 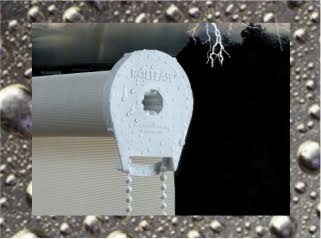 RollEase Outdoor Clutch with outdoor brackets and stainless steel bead chain; weather-proof roller and hembar. Add $25 per shade. Please be aware that the lift cords and bead chain control loops used in many window covering products, including our Clutch Roller Shades and some of our Roman Shades, present a potential strangulation hazard, particularly to young children. To address this important issue in part, the window covering industry has adapted the American National Standard for Safety of Corded Window Covering Products. The latest version of that Standard, ANSI/WCMA A100.1-2012, is now in effect. Romanzia has always taken product safety seriously and we have always done our best to meet or exceed all Industry Safety Standards including product testing, product labeling, product education, and the use of accessories like bead chain tension devises that are compliant to the Standard. The lift cords on the back of Romanzia's Roman Shades are fitted with safety shrouds between the pleats to prevent hazardous cord loops from forming. 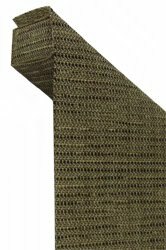 Each Roman Shade design has been tested using the Hazardous Loop Testing Procedure, Assembly, and Probe described in Appendix D of the American National Standard for Safety of Corded Window Covering Products (ANSI/WCMA A100.1-2012). The test results show that no hazardous loop can form from the shrouded cords on the back of the Roman Shades described in Romanzia's 2013 Catalog and Price List. All Romanzia products that are made to be operated with a bead chain control loop are packaged with a tension devise that is compliant with the American National Standard for Safety of Corded Window Covering Products (ANSI/WCMA A100.1-2012). Before any product with a bead chain control loop is shipped, a tension devise is attached to the bead chain in such a way that "unless properly installed or altered from the shipped condition with a sequential process or tools, it prevents the window covering from operating". For complete safety, parents and caregivers should consider cordless window coverings alternatives like our Spring Roller Shades, Cordless Roman Shades, Motorized Shades, or Panel Track Shades.